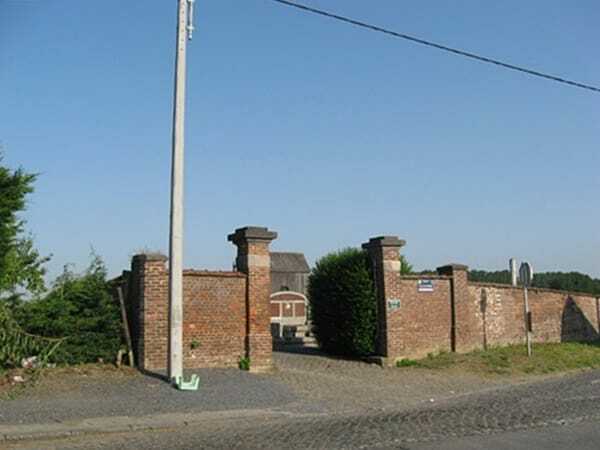 The village of Angre is located south-west of the town of Mons on the N553. From the motorway E19, which runs between Mons and Valenciennes, turn off at junction 26 onto the N552 in the direction of Thulin/Dour. Follow the N552 to the Town of Dour and the junction with the N553, turn onto the N553 in the direction of Angre/Audregnies. 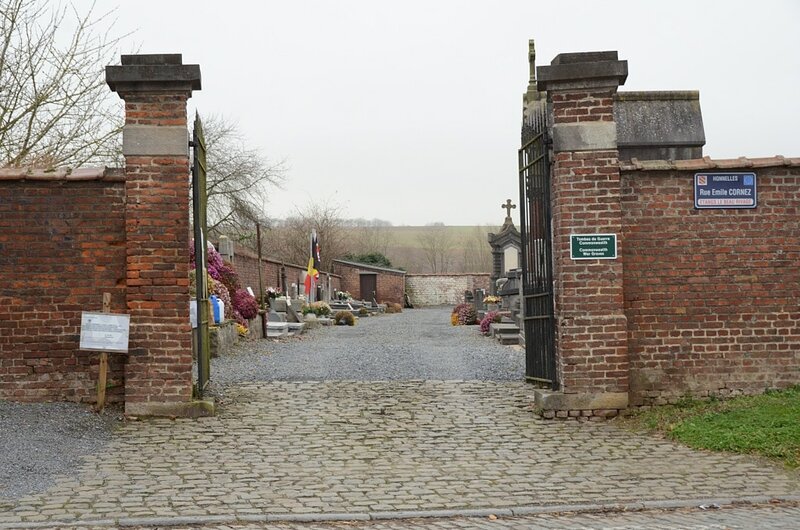 On entering the village of Angre the road bears to the left and there is a junction off to the right signed Baisieux, the cemetery is by this junction in rue E.Cornez. The graves are located in two plots. Go through the main entrance and follow the left hand path along the wall, the first plot is on the left. 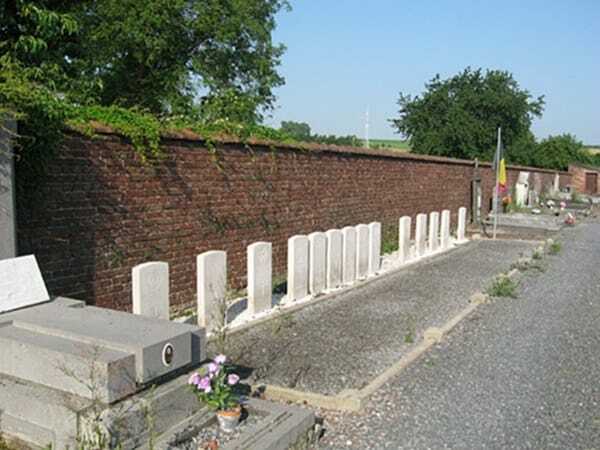 For the second plot follow the same path along the wall towards the morgue and the graves are behind the first row on the right nearly at the end of the path. Angre Communal Cemetery contains 16 Commonwealth burials of the First World War, five of which are unidentified. 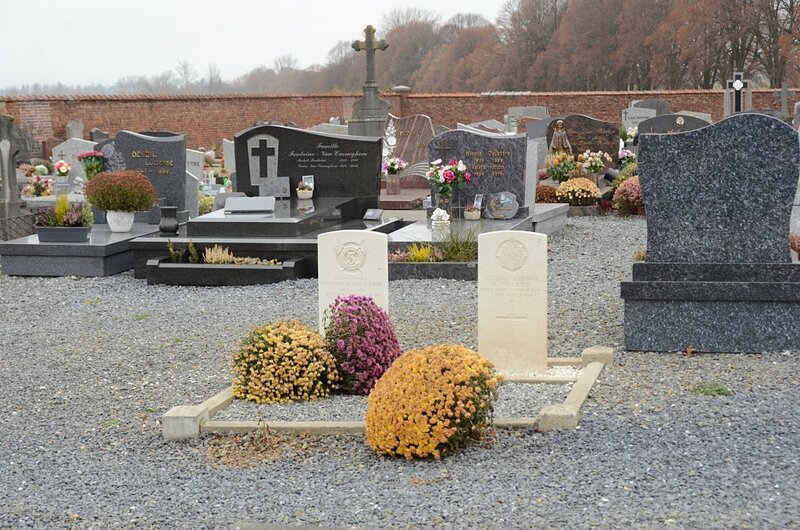 They date from August 1914 and October-December 1918, and in most cases were brought into the cemetery after the Armistice. 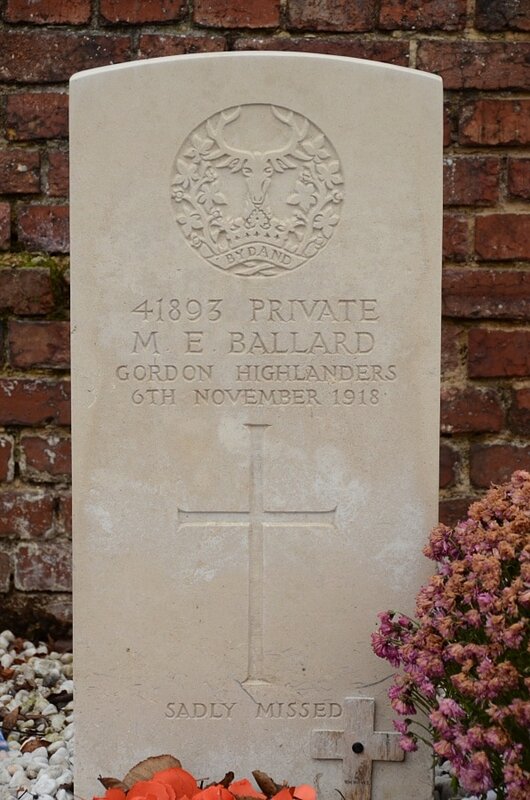 41893 Private Maurice Edward Ballard, Gordon Highlanders, posted to 1st/14th Bn. London Regt. (London Scottish), died 6th November 1918, aged 22. Son of Charles Edward & Mary Charrie Ballard of 35 Denmark Road, Ramsgate. 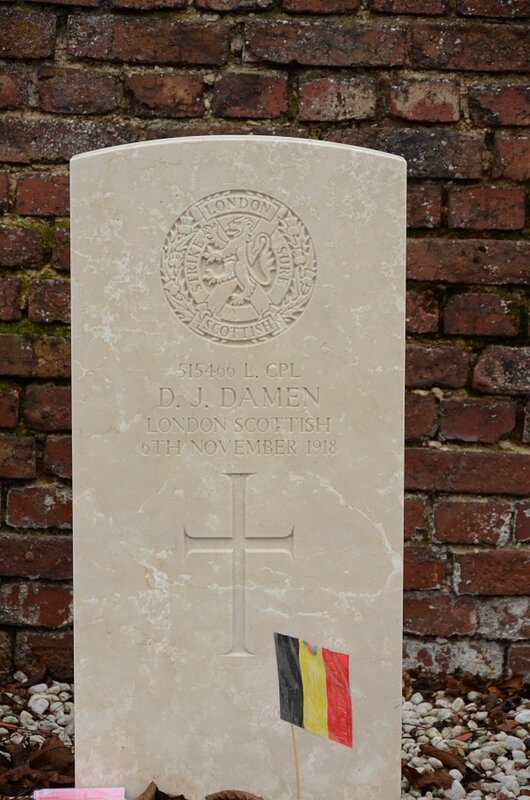 515466 Lance Corporal D. J. Damen, 1st/14th Bn. London Regt. (London Scottish), died 6th November 1918. 513107 Lance Corporal John Elliston Johnstone, 1st/14th Bn. London Regt. (London Scottish), died 5th November 1918, aged 28. 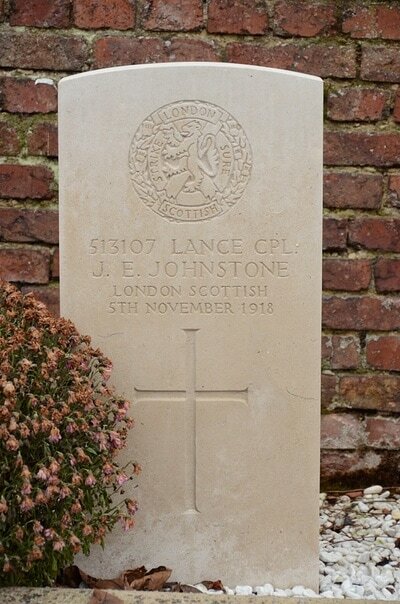 Son of Robert & Emily Bertha Johnstone of 32 Midmay Road, Chelmsford. 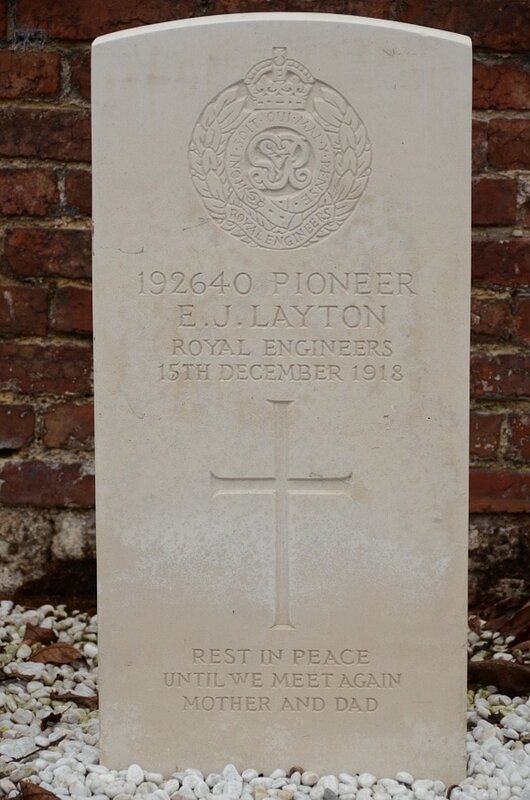 192640 Pioneer Edward James Layton, Royal Engineers, died 15th December 1918, aged 20. 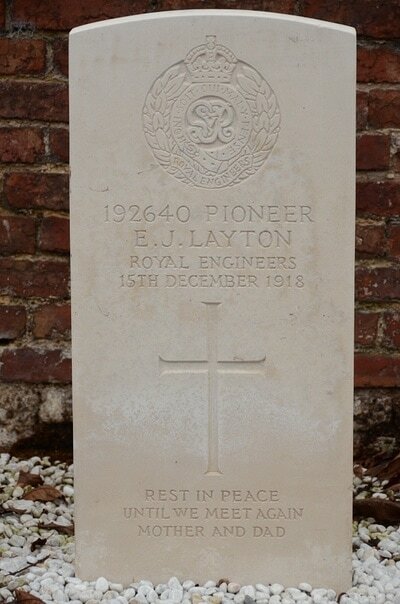 Son of William & Emily Layton of 20 Allestree Road, Fulham, London. Active service three and a half years. 514968 Private S. F. Legg, 1st/14th Bn. London Regt. (London Scottish), died 5th November 1918. 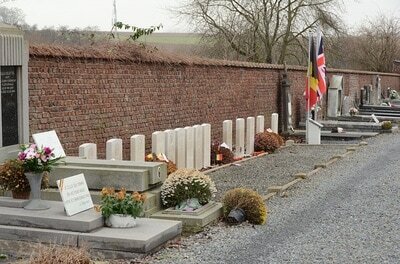 517612 Private Ronald Caerleon Livingston Mackenzie-Muir, 1st/14th Bn. London Regt. 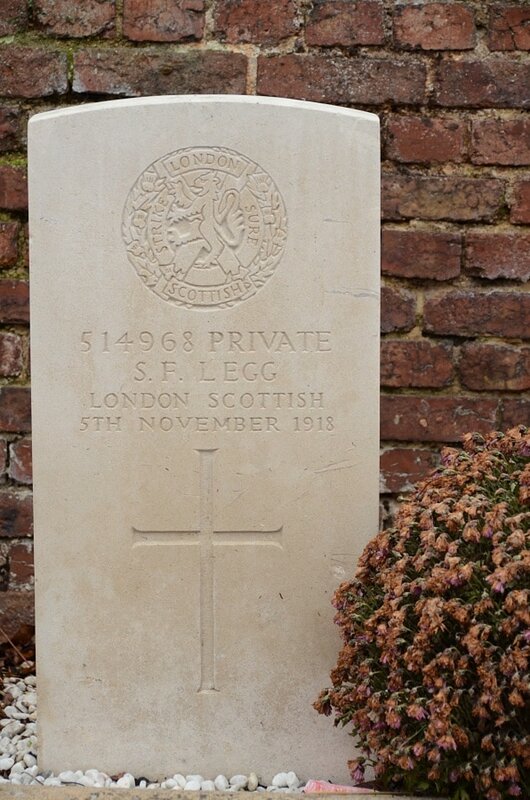 (London Scottish), died 6th November 1918, aged 19. Son of Charles Mackenzie-Muir and Kathrine Adelaide, his wife, of The Gardens, Gordon Town, Jamaica. Born at Kingston, Jamaica. Educated at Jamaica College. 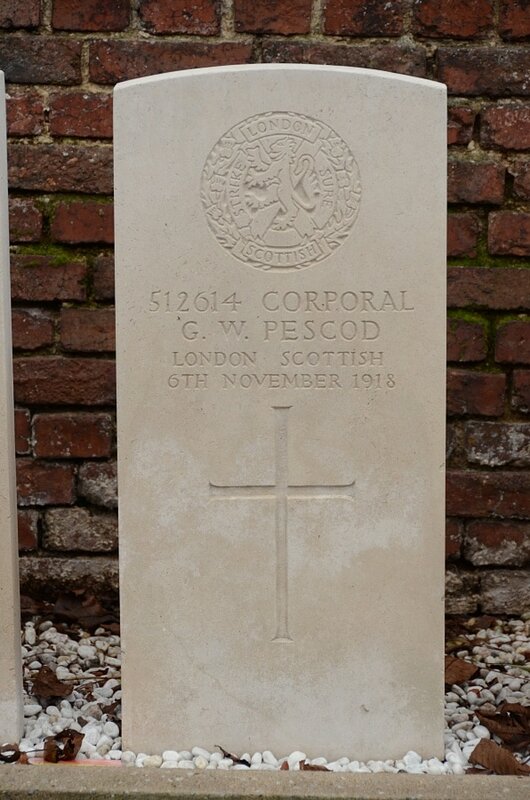 512614 Corporal George William Pescod, 1st/14th Bn. London Regt. 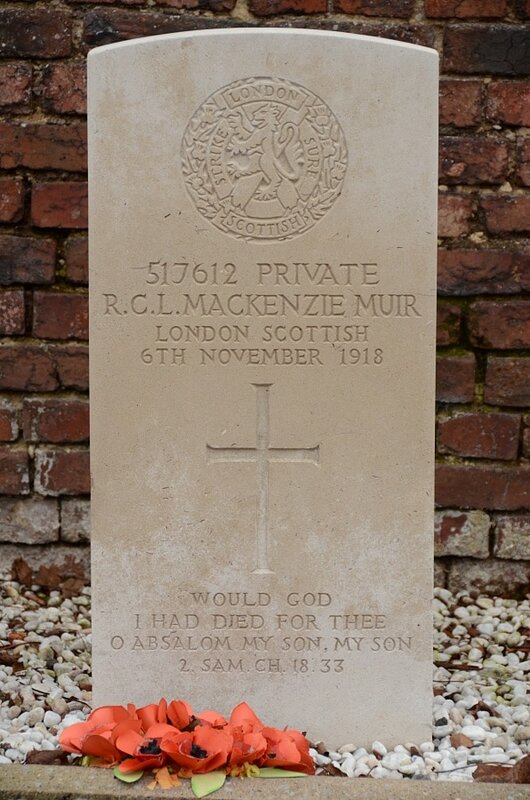 (London Scottish), died 6th November 1918, aged 24. Son of William F. and Anne Pescod of 21 The Crescent, New Southgate, London. 517638 Private William Watton Simmons, 1st/14th Bn. London Regt. 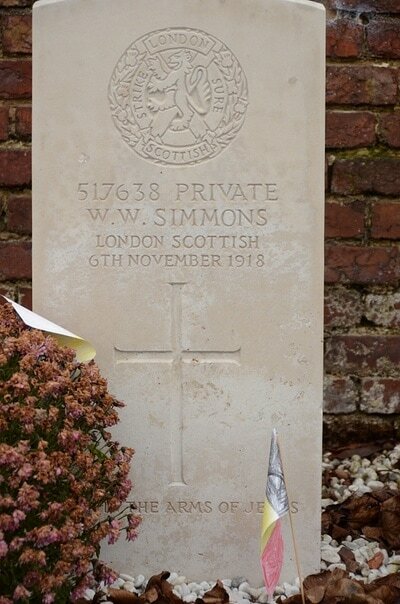 (London Scottish), died 6th November 1918, aged 19. Son of William & Mary Simmons of 14 Lake Street, Lower Gornal, Dudley. 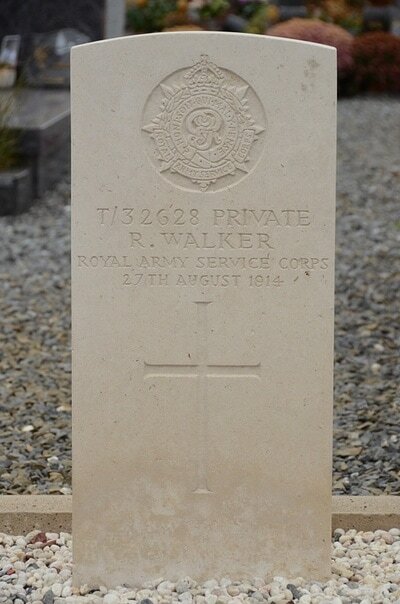 T/32628 Private R. Walker, Army Service Corps, H.T. attd.14th Infantry Brig., died 27th August 1914, aged 27. Son of Thomas Walker of 33 Mossvale Street, Belfast. 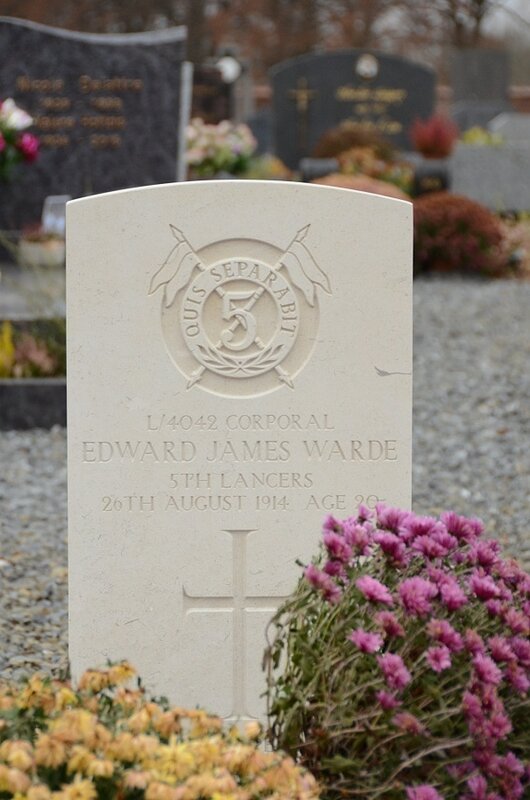 L/4042 Corporal Edward James Warde, "D" Sqdn. 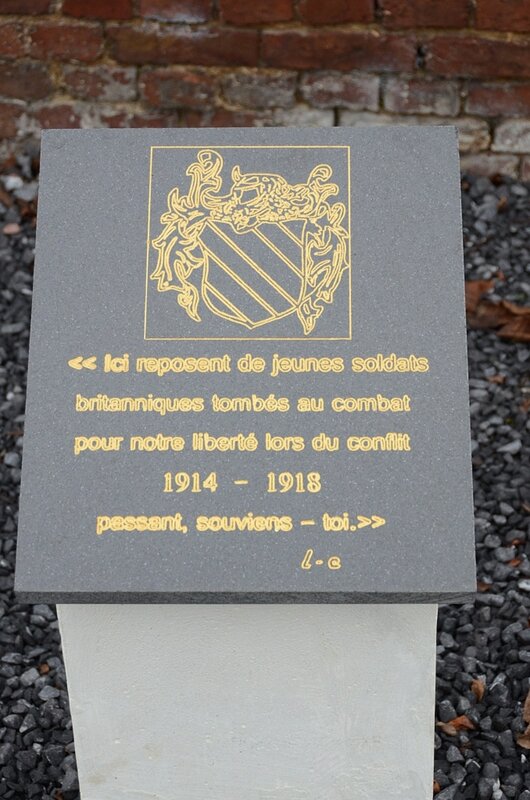 5th Royal Irish Lancers, died 26th August 1914, aged 20. Eldest son of Edward & Alice Warde of 3 Neal's Cottage, Dover Road, Upper Walmer, Deal. 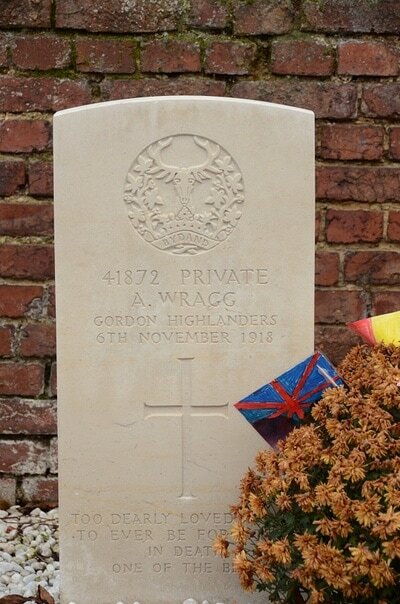 41872 Private Arthur Wragg, Gordon Highlanders, died 6th November 1918, aged 19. Son of Charles Johnathan and Kate Lily Wragg of 14 Guest Road, Hunter's Bar, Sheffield.